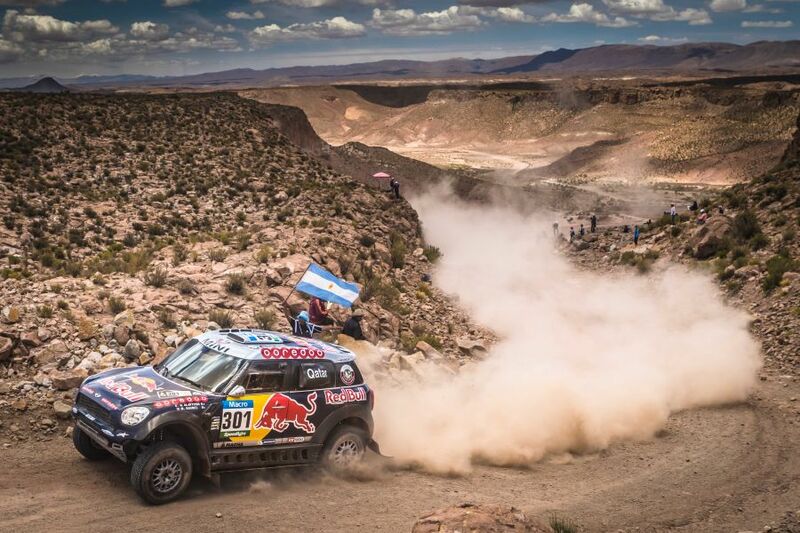 Are You Following Dakar 2016? If Not, You Should Be! Every year we talk about the Dakar Rally, but what is it about Dakar that makes it such a special event? First and foremost it is the scale. Each day’s racing stage is equal to an entire modern WRC event in length with transits as long or longer than the racing stages. It is not unheard of for teams to leave their bivouac before dawn and arrive at the next overnight stop after midnight. Then there are the conditions. 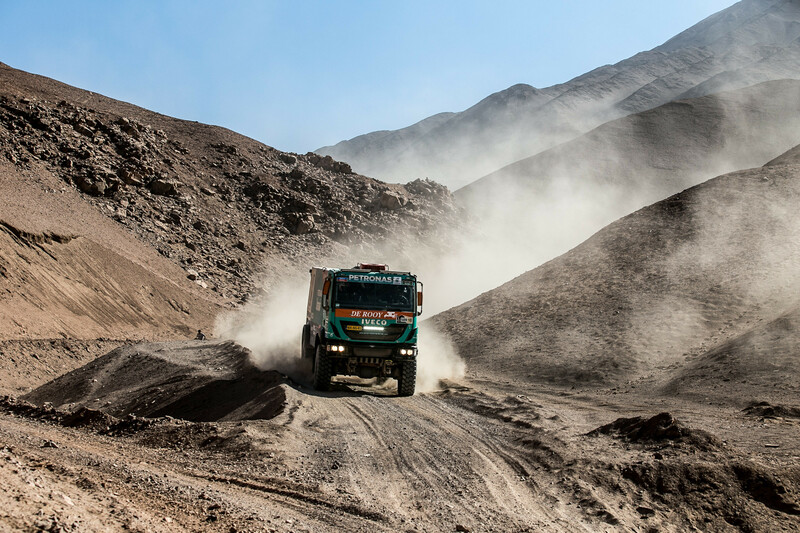 The Dakar throws everything at the teams from wet and muddy valleys to extremely hot high desert dunes or even freezing rocky narrow mountain passes. There is also the difficulty of navigation. It’s one thing to be on a closed rally stage that you’ve recce’d with a co-driver reciting every corner back to you, but it’s something altogether different when given very generalized route notes created by others and having to hit waypoints in unfamiliar places when you are hot, tired, and dealing with thin air – for sure, some of the route follows defined roads and trails, but in the open country without such trails, it’s a matter of playing connect the dots with automated GPS waypoints which “unlock” when you get within 90-200 meters. The sheer endurance required both physically and mentally to race for 2 weeks over such vast distances with only a single rest day requires a toughness not seen in any other motorsport. It is so difficult that competitors can and do die from getting lost, dehydrated, or into tragic accidents (often influenced by poor judgement brought on by fatigue). 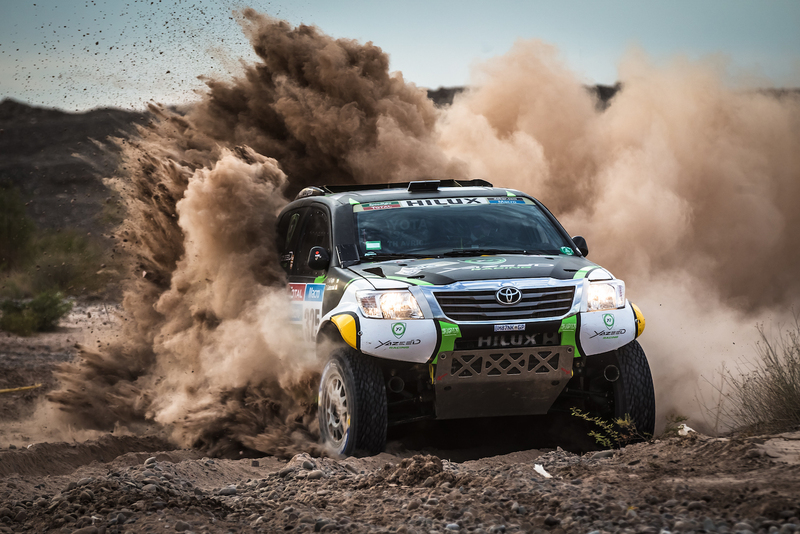 There are 4 classes of vehicles that compete in Dakar. The motorbikes and quads have an especially difficult challenge as they have to act as both pilot and navigator weaving their way through tough terrain in extreme conditions. Being on a bike for 3 or 4 hours isn’t the most comfortable experience, but balancing on two wheels for 8+ hours over endless desert dunes in high temperatures and navigating to specific waypoints is something beyond comprehension. These are also typically the fastest classes in competition. I don’t typically follow a lot of dirt bike racing, but surely the Dakar bikes consists of the toughest competitors. By far the most competitive class has to be the “car” class. This includes Buggies, SUV like vehicles such as the ultra-successful Mini X-Raid, pickup trucks like the Toyota Hi-Lux, and more custom designed vehicles like Robby Gordon’s Gordini or Peugeot’s Dakar 2008. The cars are a team sport with pilot and navigator that have to work together to make it to all the waypoints, make repairs, or even dig their machines out when stuck in the sand. The “trucks” class is something we in the states have a tougher time relating to. These consist of massive 4 wheeled military looking vehicles that are driven by a 3 man team (driver, co-driver/navigator and mechanic/engineer). For perspective on the size of these, the winner of the 2015 Dakar in this class drove a 980hp 16 Liter diesel Kamaz weighing over 22,000 lbs carrying 260 gallons of fuel on leaf sprung solid axles. Seeing these giant beasts drive over the same dunes and terrain as the cars, and sometimes jumping just as high, is a pretty unbelievable sight to say the least. So the Dakar is a unique event in that all these classes of vehicles compete at the same time and over roughly the same route. 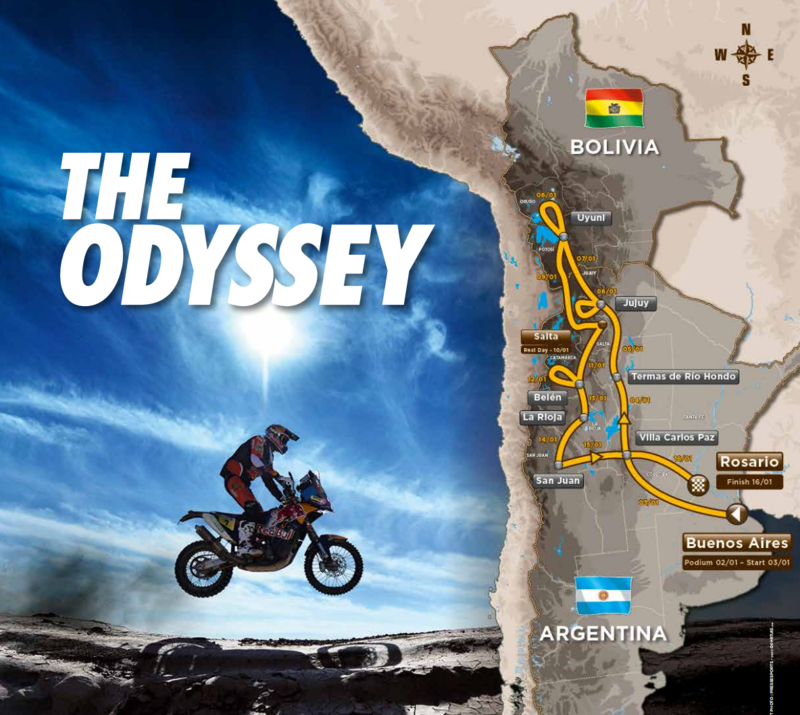 This year’s Dakar traverses just the two South American countries of Argentina and Bolivia, but still features over 2600 racing stage miles and a total distance of over 5600 miles. That’s the equivalent of driving from Seattle to New York City and back again, with half the route being off-road! Most of the classes have some great competition. The bikes have been dominated by KTM’s Spanish rider Marc Coma over the years, however his young compatriate Joan Barrreda Bort who rides for Honda has been nipping at his heels the last two Dakars. Mechanical issues placed Barreda Bort down the order last year and he’ll surely be on the attack this year. In the car class it is a veritable who’s who of rally and desert racing legends. The Peugeot Dakar team alone consists of “Mr. Dakar” Stéphane Peterhansel who has won more Dakar Rallies than anyone in history. 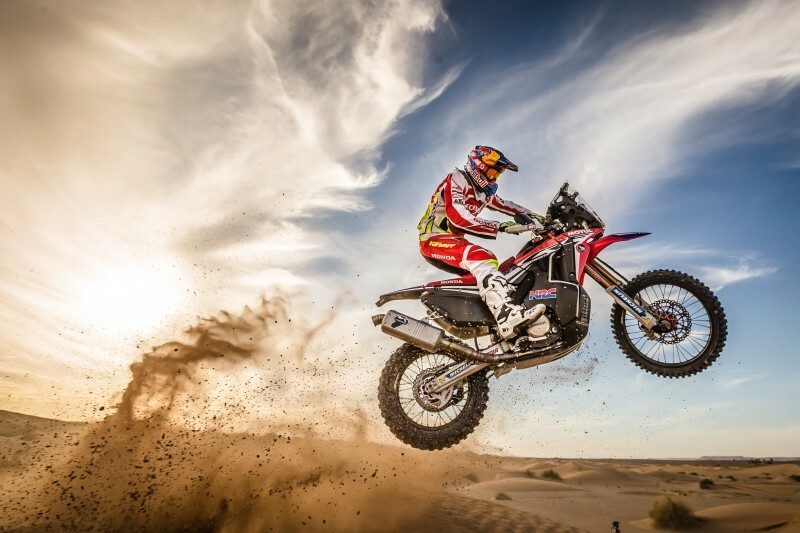 Between bikes and cars Peterhansel has 11 victories under his belt, making him the Sebastien Loeb of Dakar. Speaking of 9 times WRC Champion Sebastien Loeb, he makes his Dakar debut also as part of the Peugeot Dakar team this year. 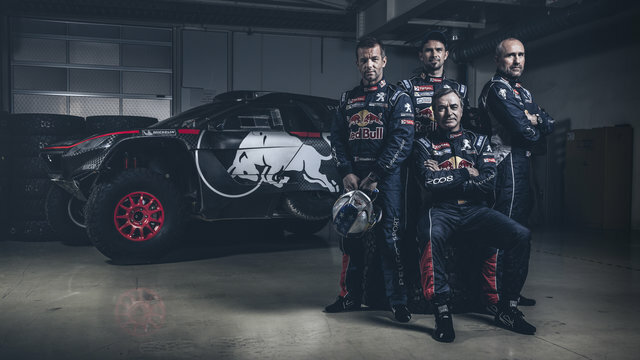 Rounding out the impressive Peugeot 4 car lineup are 2 time WRC Champion and previous Dakar winner Carlos Sainz, and 5 times bikes Dakar winner Cyril Despres. If the names above don’t grab your attention, their beast of a vehicle surely will. A little closer is the team of Robby Gordon and his custom designed Gordini Dakar trucks. Robby is well known for being flamboyant and fast with his win-it-or-bin-it attitude, and this he time brings on a young American teammate in Sheldon Creed. Creed has been extremely impressive racing trucks in the Lucas Oil and Super Stadium Truck series here in the states – at 18 years of age, he is also the youngest entry in Dakar history. 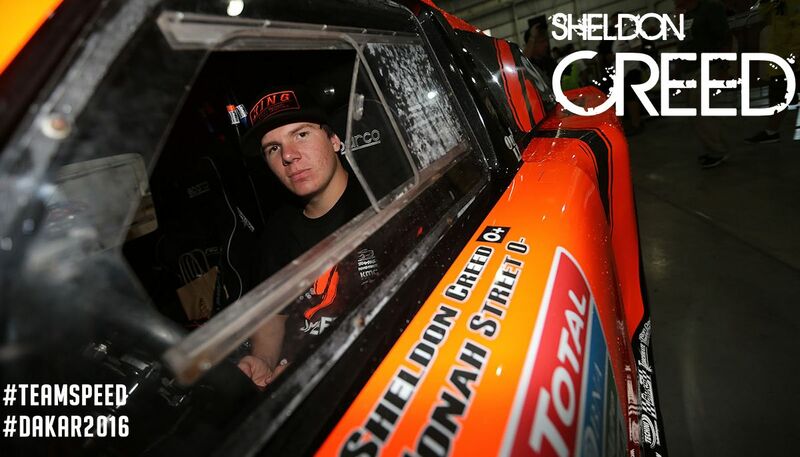 It will be interesting to see how well he performs in the challenging vastness of Dakar. And we aren’t done yet in the cars where the dominant 4wd Mini X-Raids will be lead again by last year’s Dakar Winner (his 2nd) / WRC2 Champion (his 2nd) / Middle East Rally Champion (his 11th) / Cross Country Rally World Cup Champion (also his 2nd) Nasser Al-Attiyah. Al-Attiyah has had one heck of a 2015, but can he continue that momentum into 2016? 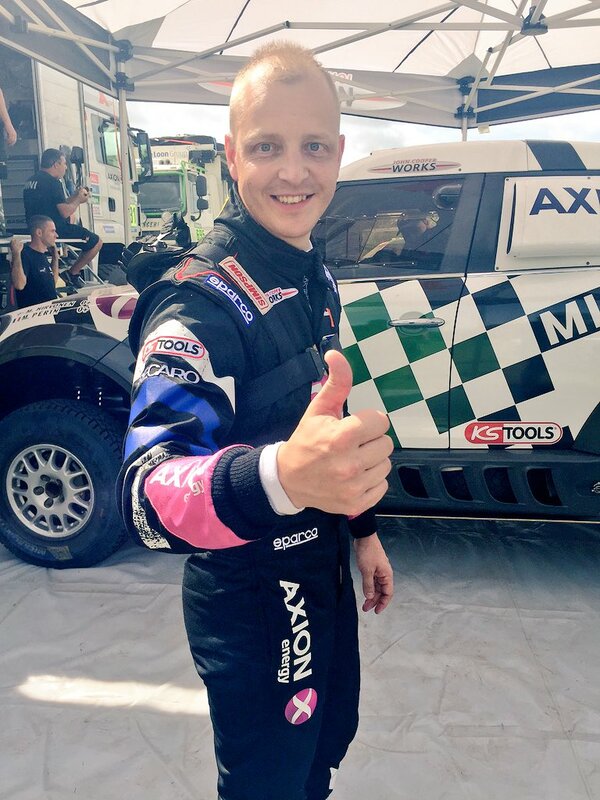 There are at least a dozen Mini X-Raid vehicles competing, and one to keep on eye on is recently retired WRC fan favorite Mikko Hirvonen. It’s his first Dakar, but considering his background as being the only driver to come close to taking the WRC Championship from Loeb, I’d expect him to do well. I could rattle on for a while in the car class, but to simplify you’ll want to keep an eye on these drivers as well. Nani Roma in a Mini, Giniel De Villiers in the Hi-Lux, Yazeed Al Rahji in a Hi-Lux, Xavier Pons in a Ford, the list goes on and on. In the big trucks? I couldn’t tell you which driver is going to win as this class is all about the teams. 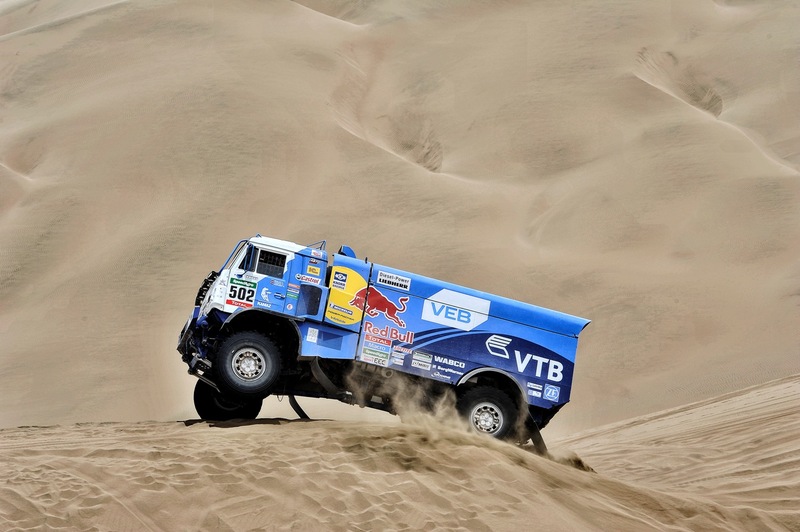 Kamaz has been the dominator in recent past, but the competition is always hot between them and Iveco and Man. It’s always a close fight. Okay, so now you’re interested in following, especially since most other forms of racing are in their off-season. How does one follow this epic journey? Well, first of all there are daily highlights on NBCSN, but the highlights are typically a day old for editing. If you want the most up to date information on who’s beating who here are some links that should keep you well informed over the next two weeks.